Berrien Moore III receives funding from the National Oceanic and Atmospheric Administration (NOAA) and NASA. Sean Crowell works for the University of Oklahoma. He receives funding from NASA. Carbon is a building block of life on our planet. It is stored in reservoirs on Earth – in rocks, plants and soil – in the oceans, and in the atmosphere. And it cycles constantly between these reservoirs. Understanding the carbon cycle is crucially important for many reasons. It provides us with energy, stored as fossil fuel. Carbon gases in the atmosphere help regulate Earth’s temperature and are essential to the growth of plants. Carbon passing from the atmosphere to the ocean supports photosynthesis of marine phytoplankton and the development of reefs. These processes and myriad others are all interwoven with Earth’s climate, but the manner in which the processes respond to variability and change in climate is not well-quantified. Our research group at the University of Oklahoma is leading NASA’s latest Earth Venture Mission, the Geostationary Carbon Observatory, or GeoCarb. This mission will place an advanced payload on a satellite to study the Earth from more than 22,000 miles above the Earth’s equator. Observing changes in concentrations of three key carbon gases – carbon dioxide (CO2), methane (CH4) and carbon monoxide (CO) – from day to day and year to year will help us to make a major leap forward in understanding natural and human changes in the carbon cycle. GeoCarb is also an innovative collaboration between NASA, a public university, a commercial technology development firm (Lockheed Martin Advanced Technology Center) and a commercial communications launch and hosting firm (SES). Our “hosted payload” approach will place a scientific observatory on a commercial communications satellite, paving the way for future low-cost, commercially enabled Earth observations. The famous “Keeling curve,” which tracks CO2 concentrations in Earth’s atmosphere, is based on daily measurements at Mauna Loa Observatory on Hawaii. It shows that global CO2 levels are rising over time, but also change seasonally due to biological processes. 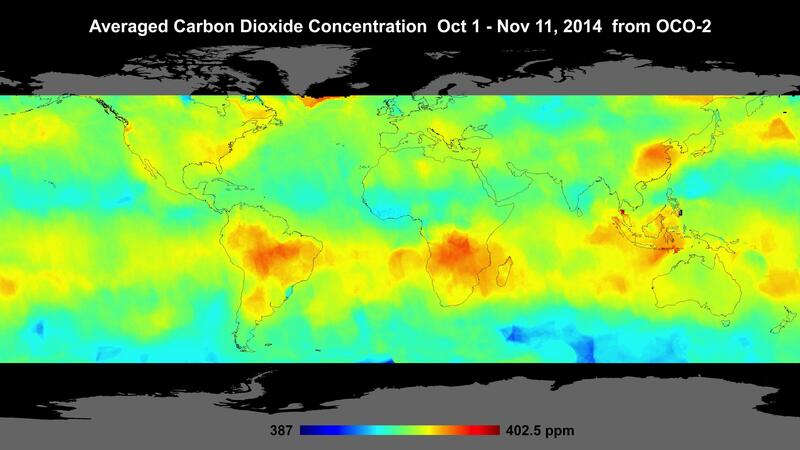 CO2 decreases during the Northern Hemisphere’s spring and summer months, as plants grow and take CO2 out of the air. It rises again in fall and winter when plants go relatively dormant and ecosystems “exhale” CO2. A closer look shows that every year’s cycle is slightly different. In some years the biosphere takes more CO2 out of the atmosphere; in others it releases more to the atmosphere. We want to know more about what causes the year-to-year differences because that contains clues on how the carbon cycle works. For example, during the El Niño of 1997-1998, a sharp rise in CO2 was largely driven by fires in Indonesia. The most recent El Niño in 2015-2016 also led to a rise in CO2, but the cause was probably a complex mixture of effects across the tropics – including reduced photosynthesis in Amazonia, temperature-driven soil release of CO2 in Africa and fires in tropical Asia. These two examples of year-to-year variability in the carbon cycle, both globally and regionally, reflect what we now believe – namely, that variability is largely driven by terrestrial ecosystems. The ability to probe the climate-carbon interaction will require a much more quantitative understanding of the causes of this variability at the process level of various ecosystems. Why study terrestrial emissions from space? GeoCarb will be launched into geostationary orbit at roughly 85 degrees west longitude, where it will rotate in tandem with the Earth. From this vantage point, the major urban and industrial regions in the Americas from Saskatoon to Punta Arenas will be in view, as will the large agricultural areas and the expansive South American tropical forests and wetlands. Measurements of carbon dioxide, methane and carbon monoxide once or twice daily over much of the terrestrial Americas will help resolve flux variability for CO2 and CH4. GeoCarb also will measure solar induced fluorescence (SIF) – plants emitting light that they cannot use back out into space. This “flashing” by the biosphere is strongly tied to the rate of photosynthesis, and so provides a measure of how much CO2 plants take in. NASA pioneered the technology that GeoCarb will carry on an earlier mission, the Orbiting Carbon Observatory 2 (OCO-2). OCO-2 launched into a low Earth orbit in 2014 and has been measuring CO2 from space ever since, passing from pole to pole several times per day as the Earth turns beneath it. Though the instruments are similar, the difference in orbit is crucial. OCO-2 samples a narrow 10-km track over much of the globe on a 16-day repeat cycle, while GeoCarb will look at the terrestrial Western Hemisphere continuously from a fixed position, scanning most of this land mass at least once per day. Where OCO-2 may miss observing the Amazon for a season due to regular cloud cover, GeoCarb will target the cloud-free regions every day with flexible scanning patterns. Daily revisits will show the biosphere changing in near-real time alongside weather satellites such as GOES 16, which is located at 105 degrees west, helping to connect the dots between the components of Earth’s system. Many processes affect levels of CO2 in the atmosphere, including plant growth and decay, fossil fuel combustion and land use changes, such as clearing forests for farming or development. Attributing atmospheric CO2 changes to different processes is difficult using CO2 measurements alone, because the atmosphere mixes CO2 from all of the different sources together. As mentioned earlier, in addition to CO2 and CH4, GeoCarb will measure CO. Burning fossil fuel releases both CO and CO2. This means that when we see high concentrations of both gases together, we have evidence that they are being released by human activities. Making this distinction is key so we do not assume that human-induced CO2 emissions come from a decrease in plant activity or a natural release of CO2 from soil. If we can distinguish between man-made and natural emissions, we can draw more robust conclusions about the carbon cycle. Knowing what fraction of these changes is caused by human activities is important for understanding our impact on the planet, and observing and measuring it is essential to any conversation about strategies for reducing CO2 emissions. GeoCarb’s measurement of methane will be a crucial element in understanding the global carbon-climate system. Methane is produced by natural systems, such as wetlands, and by human activities such as natural gas production. We do not understand the methane portion of the carbon cycle as well as CO2. But just as with CO2, methane observations tell us a lot about the functioning of natural systems. Marshes release methane as part of the natural decay in the system. The rate of release is tied to how wet/dry and warm/cool the system is. It is uncertain how much natural gas production contributes to methane emissions. One reason to quantify these emissions more accurately is that they represent lost revenue for energy producers. The Environmental Protection Agency estimates a U.S. leakage rate of around 2 percent, which could add up to billions of dollars annually. We expect based on simulations that GeoCarb will produce maps that highlight the largest leaks with only a few days of observations. Finding leaks will reduce costs for energy producers and reduce the carbon footprint of natural gas. Currently, energy companies find leaks by sending personnel with detection equipment to suspected leak sites. Newer airborne sensors could make the process cheaper, but they are still deployed on a limited basis and in an ad hoc manner. GeoCarb’s regular observations will provide leakage information to producers in a timely manner to help them limit their losses. With daily scans of landmasses in the Western Hemisphere, GeoCarb will provide an unprecedented number of high-quality measurements of CO2, CH4 and CO in the atmosphere. These observations, along with direct measurements of photosynthetic activity from SIF observations, will raise our understanding of the carbon cycle to a new level. For the first time we will be able to watch as the Western Hemisphere breathes in and out every day, and to see the seasons change through the eyes of the biosphere. Equipped with these observations, we will begin to disentangle natural and human contributions to the carbon balance. These insights will help scientists make robust predictions about Earth’s future. Will the Arctic shift from a carbon sink to a carbon source?